Spoofy design complete w/ rose-tinted binoculars. Like the movie logo, Natural Born Birders text stretches across the design underneath the bins looking at a bird. 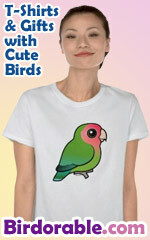 Makes a great gift for birders!